Alan Wylie was born in Glasgow, Scotland in 1938. In 1960 he graduated from the Glasgow School of Art with a degree in Mural Design and Mosaics. He immigrated to Nova Scotia in 1967 and began a career as a full-time artist, teacher, and Art Gallery owner. In 1974, he moved to British Columbia and now lives in the historical village of Fort Langley with his artist wife, Janice Robertson. 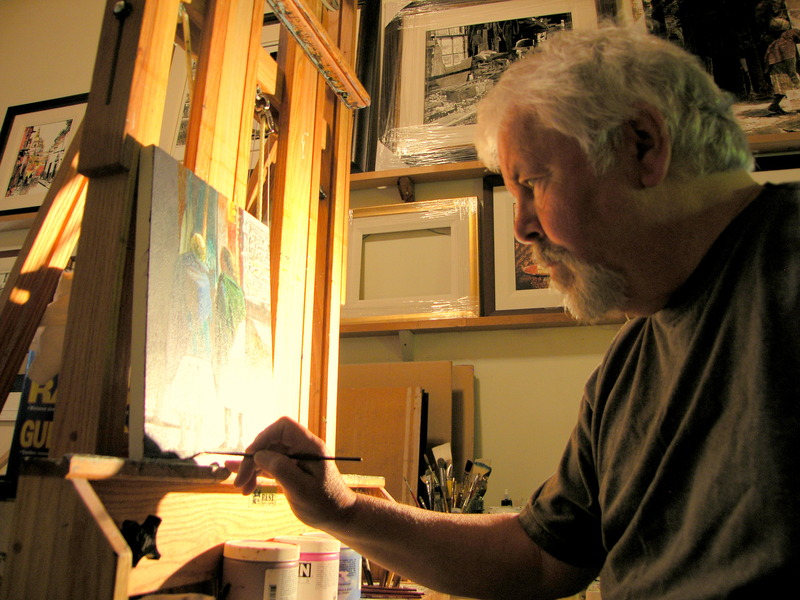 Throughout his career, Alan has participated in 76 solo shows, and innumerable group exhibitions, and has won many prestigious awards in Canada and the United States, including the Spilsbury Gold Medal (four times) of the Federation of Canadian Artists, Vancouver, the Grand Prize at the First Annual On The Edge International Exhibition in Canada, the Gold Medal of the California Watercolor Association, San Francisco, the Rouse Gold Medallion at the Adirondacks International Exhibition of American Watercolors, New York, the High Winds Medal (twice), the CFS Medal, the Mario Cooper and Dale Myers Medal, the Alden Bryan Memorial Medal, and the Dong Kingman Award, at the American Watercolor Society, New York, First Prize in the Louisiana Watercolor Society Annual International Exhibition in New Orleans, Best Flat Artist Buckle Calgary Stampede 2015, and numerous other awards in International Exhibitions. He is a Senior Signature Member and Past President of the Federation of Canadian Artists (SFCA), receiving their Lifetime Achievement Award in 2007, the Canadian Institute of Portrait Artists (CIPA), the Northwest Watercolor Society (NWWS) the California Watercolor Association (CWA), the Louisiana Watercolor Society (LWS), the Canadian Society of Painters in Watercolor (CSPWC), and a Dolphin Fellow (the first Canadian to achieve this distinction) of the American Watercolor Society (AWS., d.f.). In 2006, he was the first international juror of selection for the 105th Philadelphia Watercolor Society Exhibition, has served as juror of selection, for the 139th American Watercolor Society International Exhibition in New York, and juror of awards for the 29th Adirondacks National Exhibition of American Watercolors, Old Forge, New York. He was one of only two Canadians invited to show in the First International Contemporary Watercolor Exhibition in China, and made an honorary Member of the Jiangsu Watercolor Research Institute. Alan is also a noted mural and mosaic artist, with forty-five completed works in Scotland, Canada and the United States.